This page provides a very brief guide to connecting up your Arduino Uno - it's brief because there isn't much to do! 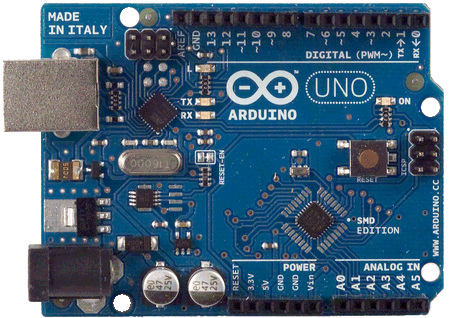 The Uno is the most popular version and certainly the one to buy as your first Arduino. Hover your mouse over the picture of the Arduino to see a description of each main component. All you need is a USB cable A-B type and a PC. Connect your Arduino to a USB socket and, if you have a genuine Arduino, if will start blinking the on-board LED at 1Hz. If you have a counterfeit or third party device, it may not. The next step is to download the Arduino IDE development environment and start programming. The IDE is a flexible tool that can program all models of Arduino/Genuino, third party clones and other non-Arduino boards such as the ESP8266. Because of this flexibility, you need to tell the IDE what type of board you are using and which programmer to use. For a UNO, use the settings for Board and Programmer as shown here. The COM port number will probably be different on your PC. Visit here for a brief description of the various hardware models available and details of shields, kits and accessories.